Díaz-Yáñez O., Mola-Yudego B. et al. (2017) What variables make a forest stand vulnerable to browsing damage occurrence? Fig. 1. Damaged plots by browsing during the per..
Table 1. Summary of stand variables included in .. Fig. 2. Mean estimated variable importance in al.. Fig. 3. Classification tree model predicting bro..
What variables make a forest stand vulnerable to browsing damage occurrence? Stand size could play a role on forest susceptibility to browsing occurrence. Increasing populations of ungulates like moose (Alces alces) and other cervids are raising the concern on the effects they have on forests (Edenius et al. 2002) and their ecosystem components (Mathisen and Skarpe 2011). Whereas ungulates are large animals appreciated for their hunting value, they can also cause extensive damage on forest stands, changing their structure by inhibiting regeneration, delaying tree growth and affect the species richness of the feeding stand (Edenius et al. 1995; Hester et al. 2000). In Norway, browsing is associated to the highest damage levels on forest lands compared to other disturbances although the frequency of browsing damage has varied along the period 1995–2014 (Díaz-Yáñez et al. 2016). The ungulates’ behavior is difficult to model and arguably poses a challenge to risk modeling, whereas forest stand characteristics, on the other hand, are easier to study and can help determine how vulnerable forests are to browsing damage. In this sense, a better understanding of the forests’ vulnerability can be used to make inferences about the process of resource selection of moose, based on surrogate predictors. Previous studies have pointed out different forest based variables that are related to browsing damage risk, like the stand composition: earlier studies demonstrated that the dietary preferences of the animals make stands with preferred tree species more vulnerable to browsing, in some cases to a limited extend (Edenius 1991) and in others as one of the determinant variables (Jalkanen 2001; Pietrzykowski et al. 2003; Vehvilainen and Koricheva 2006). In Norway, the most important species for moose diet are birch (Betula spp.) and other broadleaves like rowan (Sorbus aucuparia L.), willow (Salix spp.) and aspen (Populus tremula L.) (Wam and Hjeljord 2010). Ungulates use spruce stands for sheltering during day time or winter cover, as they present little forage possibilities (Mysterud et al. 2002). Forage preference can also change seasonally, making for example selectivity for birches higher in summer than winter (Wam and Hjeljord 2010). The damage intensity also changes with the available food quality; for instance, moose typically browse larger biomass quantities in smaller areas when the food quality is lower, meaning less palatable species (Saether and Andersen 1990). Another variable linked to browsing risk is the stand diversity; the more diverse the stand, the higher damage risk expected, even over less palatable species (Vehvilainen and Koricheva 2006). This is common on mixed stands where the understory species are broadleaves with a conifer overstory (Brandeis et al. 2002). Other variables like ungulate population size or location of the stand, whether on migration routes or close to shelter areas, also increase the stand vulnerability to browsing, independently of their species composition and diversity (Mysterud et al. 2002). The size of the stand is another factor related to the risk of browsing damage. Browsing is relatively greater in larger stands than small ones, as it is also linked to the species quality and structure of the stand (Pietrzykowski et al. 2003). Management actions modifying the stand structure have been proposed to reduce the risk of browsing damage. One of those management recommendations involves a delay on the removal of larger specimens close to seedlings, as it reduces the discovery rate of the tree seedlings and therefore the risk of damage (Brandeis et al. 2002; Pietrzykowski et al. 2003). Another management actions connected to the stand structure are silvicultural treatments like thinnings: despite thinnings may improve the forage quality and quantity, they can also create barriers and impede ungulates movement into the stand when heavy slash is present, and therefore reduce the browsing damage (Emmingham et al. 1989). Highly dense stands can also complicate the access of ungulates to the stand and therefore reduce the browsing damage (Jactel et al. 2009). Finally, stand age is another factor influencing the risk of browsing damaged. Stand age has been used in browsing predicting models, together with other highly correlated variables such as height (Jalkanen 2001), as they describe the amount of forage available at a suitable height. All these variables, among others, are directly or indirectly related to the occurrence of browsing damage. However, as observed in the literature, there are multiple interrelations and confounding effects that complicate the analysis of stand vulnerability to damage, thus a solid analysis requires a large amount of observations and suitable methodological approaches that can accommodate this complexity. National Forest Inventories are a suitable source of data for analysis as can provide extensive empirical data that have proved to be useful for predicting and understanding browsing damage on forests (Hörnberg 2001a; Hörnberg 2001b; Jalkanen 2001), despite the fact that are not specifically designed for this purpose and can present limitations (Nevalainen et al. 2016). In the present study, we used the Norwegian National Forest Inventory to identify the forest variables, and their values, leading to a higher probability of browsing damage occurrence. Specifically, the aims of this study are: 1) identify the variables affecting the probability of browsing damage, 2) study the sign and magnitude of the effect of the identified variables on the probability of browsing damage occurrence, and 3) develop a predictive model for browsing damage occurrence at stand level. The ultimate ambition being to provide useful information to define management decisions aiming at reducing unwanted browsing effects. The data was based on the Norwegian National Forest Inventory (NFI) entailing the period 1995–2014, corresponding to the 7th, 8th, 9th and 10th inventories. The Norwegian NFI is a systematic inventory with permanent plots of 250 m2 in a 3×3 km grid. In this study, we considered all plots with damage records, except those located in Finnmark (Fig. 1) due to the scarcity of forest lands in the region. The occurrence of damage at stand level was measured in an area of 1000 m2 around the plots. Plots were considered damaged by browsing when the damage was higher than 5%, defined in young stands as the percentage of dead or damaged future trees as a part of the original number of trees; or in old forest as the percentage of stand crown mass that is grazed away (Skoglandskap 2007). Variables describing the forest stand, site and treatment were used to characterize the absence or presence of browsing damage (Table 1). All the variables reflected the state of the stand before the damage was recorded, i.e. if the damage was assessed in the 8th inventory measurement, the stand and treatment information corresponded with the 7th measurement. We only considered the most forested part of plots divided by a stand border, i.e. plots with one part on forest and the other on water or agricultural land. In total 29 338 records were included. Fig. 1. Damaged plots by browsing during the period 2000–2014. Table 1. Summary of stand variables included in the analysis with an overview of their predicted effect on browsing damage occurrence. In brackets is the name of the variables used in the models and in square brackets the units when available or a C if the variable is categorical (details and description of the variables are provided in the Supplementary file 1). The predicted effect is “+” when the variable increment means an increase in damage occurrence probability; “-” when the variable increment means a decrease in damage occurrence probability; “Not clear” when the trend is not clear; “NA” when the variable trend is not available. 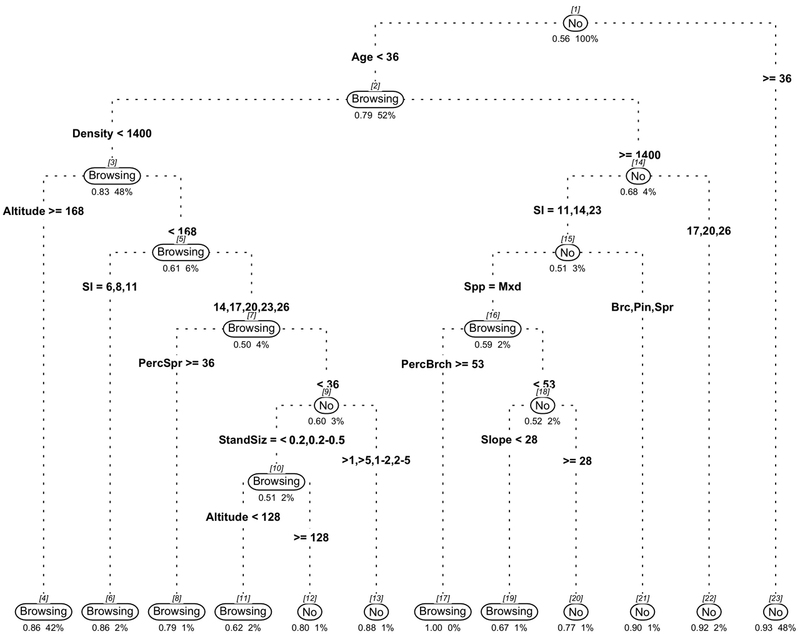 We applied classification tree methods, which are an approach based on machine learning that provides effective ways to explore numerically and graphically complex relationships in the data (De’ath and Fabricius 2000; Selkimäki et al. 2011). They are also flexible in handling different types of variables; they are relatively easy to understand and implement and able to handle missing values. We followed the general steps of this type of analysis: 1) divide data using splitting criteria, 2) forming a final tree, 3) pruning the final tree to reduce its size and increase its classification abilities avoiding overfitting. We used the Gini index as a measure of impurity to define the splitting criteria, and we set five plots as the criterion for minimum size nodes, i.e. the final tree should have a minimum of five plots in each node and final leaves. Cross validation has been used to select the final tree size by using the one standard error rule (Breiman et al. 1984). All the trees were calculated with the R package rpart (Therneau et al. 2015). The predictive evaluation of the models was done using performance metrics like mean accuracy and error rate, and the area under the curve (AUC) of the receiver operating characteristics (ROC). As expected, the number of plots damaged and undamaged were not equally represented: our data had a distribution of 28 497 undamaged plots and 841 plots damaged by browsing, giving a prior probability of 0.97 for undamaged plots. This imbalance would lead to classify correctly the undamaged plots and misclassify many damaged plots (Chawla 2003). Several methods have been developed in machine learning approaches to make datasets more balanced (Kubat and Matwin 1997; Chawla et al. 2002; Chawla 2003) and among these, under-sampling of the majority class has been proposed as a good method to improve the minority class classification (Chawla 2003). Based on this, we under-sampled undamaged plots until the damaged plots represented certain percentage of the undamaged plots (i.e. an under-sample of 100% resulted in a dataset where there were equal number of damaged and undamaged plots). There were ten under-sample percentages selected systematically every 10 (i.e. 10%, 20%, 30%,… 100%) and five repetitions per percentage, resulting in 50 model alternatives. From this pool, the model that better described the data and presented the highest predictive power was selected as the final candidate to present the analysis. Finally, the variables were further analyzed according to their average importance in the trees. The variable importance was calculated based on the goodness of the split measure when it acts as primary variable and the goodness for the splits were it acts as surrogate variable (following Breiman et al. 1984). Across the 50 models considered (one per each dataset where the majority class was under-sampled), the ranking of variable importance was consistent (Fig. 2). The variables used in the classification trees were mainly explaining stand structure and composition although site variables were also present. The ten most important variables defining browsing damage occurrence were: mean trees’ age, development class, basal area, density, diameter, Gini coefficient of the trees basal area, stand size, altitude, previous treatment, and percentage of pine. In general, the variable values making a stand more vulnerable to browsing damage (Table 1) would define a young stand with low densities, or a stand with pine or mixed. The variable PrevTr indicated that stands were more susceptible to damage after treatments such as thinning, selective cutting or regeneration planting. The variables Gini and Shannon indicated that stands with heterogeneous structures or diverse were more susceptible to browsing damage. Finally, the most important site related variables were altitude, slope and site index. Fig. 2. Mean estimated variable importance in all 50 models and variability associated. The value 100 corresponds to the most important variable, and the rest are presented in relation to this score. Bars relate to the variability of the values. For all models, age had systematically the highest importance score. The selected model resulted from an under-sampled dataset where the number of all the damaged plots accounted for 80% of the randomly selected undamaged plots (Fig. 3). The model was chosen due to its high predictive and explanatory power (AUC = 0.9), high sensitivity (0.82) and specificity (0.77), meaning that there was a high proportion of damaged and undamaged stands correctly identified, and finally, high accuracy (0.80). The model explanatory power was high and included the most important variables explaining the stand vulnerability to browsing damage. The first split in node 1 indicated that young stands were more susceptible to browsing damage; the surrogate variable in this node was development class, also indicating that earlier development classes had higher vulnerability to damage. Node 2 divided the stands according to their density, showing that stands with high densities (>1400 trees ha–1) had a lower browsing probability (P = 0.32); the surrogate variable in this node was the basal area, indicating that stands with basal area above 20 m2 ha–1 also had a low probability to be damaged. The node 3 made a spatial differentiation between stands located at different altitudes; those stands located over 168 m of altitude had the highest damage probability for lower densities stands (P = 0.86) but also, stands below 168 m of altitude but on low productivity sites (node 5) had the highest probability of browsing damage (P = 0.86). The node 15 divided the plots according to the dominant species indicating that mixed stands that were denser (>1400 trees ha–1) had high probabilities of browsing damage (P > 0.67). Finally, in node 7, plots were divided according with the percentage of spruce presence, showing that stands with low spruce presence or stands dominated by birch, pine or mixed stands (indicated by the surrogate variable dominant specie) and that had small size (<0.5 ha), had high probability of browsing damage, especially in low altitudes (P > 0.51). Variables describing characteristics like composition, structure, site or management are helpful to evaluate the vulnerability of a stand to suffer from ungulate browsing. This study identified the main variables related to browsing damage occurrence and presented a model predicting the occurrence of browsing damage. We developed the model using classification trees as it is an approach that can accommodate complex relationships between variables, with a high predictive power. The method was applied to find the right complexity not susceptible to overfitting. Whereas the results showed that some variables, like altitude or site index, tended to spatially overfit the models, as they characterized very specifically located groups of stands, most of the variables considered, like age, tree density, species composition, stand size, and previous treatments delivered interesting patterns. Age and stand development class proved to be the most important variables predicting browsing damage occurrence in our models. As expected, browsing damage typically happened on young stands (Díaz-Yáñez et al. 2016) as they offer more forage at a suitable height (Jalkanen 2001). High tree densities decreased browsing damage occurrence in the studied area. This agrees with results on pine stands, where higher density in the stand reduced browsing on branches, pine leaders and bark stripping (Andren and Angelstam 1993). There are two possible explanations linking an increment in tree density with a decrease on browsing damage occurrence. First, more dense stands might complicate the access of ungulates preventing them from browsing in those stands (Jactel et al. 2009). A second possible explanation could be related with the browsing possibilities in the stand itself. In a highly dense stand there is more food available and ungulates tend to only choose the best quality twigs available in each tree, meaning that typically in these stands ungulates reduce the intake per tree (Vivas and Saether 1987; Edenius et al. 2002). On the other hand, when there are less forage options in the stand, due to lower tree density, each of the trees might suffer more browsing pressure (Hörnberg 2001b). Arguably, although the total biomass browsed in a denser stand might be higher, the relative impact of each tree would be lower. These results indicate that special preventive actions are recommended when young stands have densities bellow 1400 trees ha–1, as those stands present the highest probabilities of suffering browsing damage. We found that birch, pine and mixed dominated stands were more favorable to browsing damage than spruce dominated stands, as shown earlier (Jalkanen 2001; Edenius et al. 2002). In our models, the Shannon index also indicated that diverse stands are more susceptible to suffer browsing damage, as found in earlier studies (Vehvilainen and Koricheva 2006a; Nevalainen et al. 2016). Plants in diverse stands may suffer more from browsers when those are generalist herbivores like moose, as they can benefit from the broader species range. Also, stands with high diversity may combine more palatable species with less palatable ones, making the browser also feed from the less preferred species after the depletion of the favored ones (Brandeis et al. 2002; Milligan and Koricheva 2013). Therefore, the stand’s species diversity should be stressed and considered in forest management actions, especially when the forest practices favor the increment of mixed stands with birch or other mixtures of deciduous species. Thus, management actions increasing the presence of more diverse stands can combined with precise knowledge of the presence and density of ungulates populations in the area. Stand size was one of the ten most important variables in our analysis, although it did not indicate a clear predictive effect, like results found in neighboring countries (Andren and Angelstam 1993). Smaller stands can create more favorable habitats for moose by decreasing the distances between forage and shelter areas and entailing more edges and patches (Edenius et al. 2002). But larger stands are typically more damaged as ungulates spend more time foraging within those stands (Shipley and Spalinger 1995; Pietrzykowski et al. 2003; Nevalainen et al. 2016). In Norway, it has been shown that the changes in stand size due to agriculture and forest management had an impact on the ungulates population (Mysterud et al. 2002), and the ungulates population size has a direct effect on the probability of browsing damage occurrence. Previous treatments applied on stands influence as well the probability of browsing damage. In Fennoscandia, clear cuts are a common treatment in managed forests leaving open areas with borders, that are very attractive to ungulates (Reimoser and Gossow 1996). Other common treatments like thinnings or cleanings can have a double impact: one increasing the damage, as they provide more quality food, but also the contrary effect, reducing the browsing as they can temporarily avoid the entrance of the ungulates due to excessive slash (Emmingham et al. 1989; Nevalainen et al. 2016). It has been suggested that cleaning could be delayed in order to increase the food availability and avoid depletion of certain species (Heikkilä and Härkönen 1996). Finally, treatments improving regeneration like planting or opening of gaps through selective cuttings also increase the probability of browsing occurrence due to the increase of suitable feeding plants. As a conclusion, the results from this study indicate that certain variables, like stand composition, tree density and stand size were affecting the probability of browsing damage occurrence and should be taken into consideration when making management decisions. Based on these principles, management actions should avoid aiming at young stands with low densities, and consider that when oriented to obtain more close-to-nature structures, with higher compositional diversity, we can favor the presence or abundance of species that ungulates prefer. We also conclude that the stand size variable should be further studied as it might provide more insight and potential management measures to avoid browsing damage. Stand size and other spatial analysis, like stand connectivity, could be studied combined with other tools like airborne laser scanning (Melin et al. 2016), providing interesting management information at landscape level. Finally, it must be considered that other variables like the actual ungulate density (Hörnberg 2001a; Bergqvist et al. 2014) or information about previous browsing damage (Bergqvist et al. 2003) would play a fundamental role to evaluate the vulnerability of a stand. The inclusion of all these factors will determine the occurrence of browsing damage and whether the damages are part of the forest dynamics or a threat for the future of the forest. Despite its limitations, the current study provides relevant analysis entailing data for a large area along 20 years, contributing to expand the literature of browsing damage and its relationship with forest management. We are grateful to the forest doctoral school of the University of Eastern Finland for their kind economic support, as well as to the SIS-Redclim, funded by the Norwegian Institute of Bioeconomy Research. José Ramón González-Olabarria was supported by a “Ramon y Cajal” research contract from the MINECO (Ref. RYC-2013-14262) and from CERCA Programme / Generalitat de Catalunya. Andren H., Angelstam P. (1993). Moose browsing on Scots pine in relation to stand size and distance to forest edge. Journal of Applied Ecology 30(1): 133–142. https://doi.org/10.2307/2404277. Bergqvist G., Bergström R., Edenius L. (2003). Effects of moose (Alces alces) rebrowsing on damage development in young stands of Scots pine (Pinus sylvestris). Forest Ecology and Management 176(1–3): 397–403. https://doi.org/10.1016/S0378-1127(02)00288-8. Bergqvist G., Bergström R., Wallgren M. (2014). Recent browsing damage by moose on Scots pine, birch and aspen in young commercial forests – effects of forage availability, moose population density and site productivity. Silva Fennica 48(1) article 1077. https://doi.org/10.14214/sf.1077. Brandeis T.J., Newton M., Cole E.C. (2002). Biotic injuries on conifer seedlings planted in forest understory environments. New Forest 24(1): 1–14. https://doi.org/10.1023/A:1020553021748. Breiman L., Friedman J., Stone C.J., Olshen R.A. (1984). Classification and regression trees. Chapman and Hall/CRC. 368 p.
Chawla N.V. (2003). C4.5 and imbalanced data sets: investigating the effect of sampling method, probabilistic estimate, and decision tree structure. In: Proceedings of the ICML’03 Workshop on Class Imbalance. Chawla N.V., Bowyer K.W., Hall L.O., Kegelmeyer W.P. (2002). SMOTE: Synthetic Minority Over-sampling Technique. Journal of Artificial Intelligence Research 16: 321–357. https://doi.org/10.1613/jair.953. De’ath G., Fabricius K.E. (2000). Classification and regression trees: a powerful yet simple technique for ecological data analysis. Ecology 81(11): 3178–3192. https://doi.org/10.1890/0012-9658(2000)081[3178:CARTAP]2.0.CO;2. Díaz-Yáñez O., Mola-Yudego B., Eriksen R., González-Olabarria J.R. (2016). Assessment of the main natural disturbances on Norwegian forest based on 20 years of national inventory. PLoS ONE 11: e0161361–16. https://doi.org/10.1371/journal.pone.0161361. Edenius L. (1991). The effect of resource depletion on the feeding behaviour of a browser: winter foraging by moose on Scots pine. Journal of Applied Ecology 28(1): 318–328. https://doi.org/10.2307/2404132. Edenius L., Danell K., Nyquist H. (1995). Effect of simulated moose browsing on growth, mortality, and fecundity in Scots pine: relations to plant productivity. Canadian Journal of Forest Research 25(4): 529–535. https://doi.org/10.1139/x95-060. Edenius L., Bergman M., Ericsson G., Danell K. (2002). The role of moose as a disturbance factor in managed boreal forests. Silva Fennica 36(1): 57–67. https://doi.org/10.14214/sf.550. Emmingham W.H., Bondi M., Hibbs D.E. (1989). Underplanting western hemlock in a red alder thinning: early survival, growth, and damage. New Forest 3(1): 31–43. https://doi.org/10.1007/BF00128899. Heikkilä R., Härkönen S. (1996). Moose browsing in young Scots pine stands in relation to forest management. Forest Ecology and Management 88(1–2): 179–186. https://doi.org/10.1016/S0378-1127(96)03823-6. Hester A.J., Edenius L., Buttenschøn R.M., Kuiters A.T. (2000). Interactions between forests and herbivores: the role of controlled grazing experiments. Forestry 73(4): 381–391. https://doi.org/10.1093/forestry/73.4.381. Hörnberg S. (2001a). Changes in population density of moose (Alces alces) and damage to forests in Sweden. Forest Ecology and Management 149(1–3): 141–151. https://doi.org/10.1016/S0378-1127(00)00551-X. Hörnberg S. (2001b). The relationship between moose (Alces alces) browsing utilisation and the occurrence of different forage species in Sweden. Forest Ecology and Management 149(1–3): 91–102. https://doi.org/10.1016/S0378-1127(00)00547-8. Jactel H., Nicoll B.C., Branco M., González-Olabarria J.R., Grodzki W., Langstrom B., Moreira F., Netherer S., Orazio C., Piou D., Santos H., Schelhaas M.-J., Tojic K., Vodde F. (2009). The influences of forest stand management on biotic and abiotic risks of damage. Annals of Forest Science 66(7): 701–701. https://doi.org/10.1051/forest/2009054. Jalkanen A. (2001). The probability of moose damage at the stand level in southern Finland. Silva Fennica 35(2): 159–168. https://doi.org/10.14214/sf.593. Kubat M., Matwin S. (1997). Addressing the curse of imbalanced training sets: one-sided selection. In: Fourteenth International Conference on Machine Learning, Nashville, Tennesse. p. 179–186. Mathisen K.M., Skarpe C. (2011). Cascading effects of moose (Alces alces) management on birds. Ecological Research 26(3): 563–574. https://doi.org/10.1007/s11284-011-0815-6. Melin M., Matala J., Mehtätalo L., Suvanto A., Packalén P. (2016). Detecting moose (Alces alces) browsing damage in young boreal forests from airborne laser scanning data. Canadian Journal of Forest Research 46(1): 10–19. https://doi.org/10.1139/cjfr-2015-0326. Milligan H.T., Koricheva J. (2013). Effects of tree species richness and composition on moose winter browsing damage and foraging selectivity: an experimental study. Journal of Animal Ecology 82(4): 739–748. https://doi.org/10.1111/1365-2656.12049. Mysterud A., Langvatn R., Yoccoz N.G. (2002). Large‐scale habitat variability, delayed density effects and red deer populations in Norway. Journal of Animal Ecology 71(4): 569–580. https://doi.org/10.1046/j.1365-2656.2002.00622.x. Nevalainen S., Matala J., Korhonen K.T., Ihalainen A., Nikula A. (2016). Moose damage in National Forest Inventories (1986–2008) in Finland. Silva Fennica 50(2) article 1410. https://doi.org/. https://doi.org/10.14214/sf.1410. Pietrzykowski E., McArthur C., Fitzgerald H., Goodwin A.N. (2003). Influence of patch characteristics on browsing of tree seedlings by mammalian herbivores. Journal of Applied Ecology 40(3): 458–469. https://doi.org/10.1046/j.1365-2664.2003.00809.x. Reimoser F., Gossow H. (1996). Impact of ungulates on forest vegetation and its dependence on the silvicultural system. Forest Ecology and Management 88(1–2): 107–119. https://doi.org/10.1016/S0378-1127(96)03816-9. Saether B.E., Andersen R. (1990). Resource limitation in a generalist herbivore, the moose Alces alces: ecological constraints on behavioural decisions. Canadian Journal of Zoology 68(5): 993–999. https://doi.org/10.1139/z90-143. Selkimäki M., González-Olabarria J.R., Pukkala T. (2011). Site and stand characteristics related to surface erosion occurrence in forests of Catalonia (Spain). European Journal of Forest Research 131(3): 727–738. https://doi.org/10.1007/s10342-011-0545-x. Shipley L.A., Spalinger D.E. (1995). Influence of size and density of browse patches on intake rates and foraging decisions of young moose and white-tailed deer. Oecologia 104(1): 112–121. https://doi.org/10.1007/BF00365569. Skoglandskap (2007). Håndbok fra Skog og landskap 06/2007. Landsskogtakseringens feltinstruks 2007. 116 s. + vedlegg. Therneau T.M., Atkinson E.J., Mayo Foundation. (2015). An introduction to recursive partitioning using the RPART routines. Technical report. Mayo Foundation. Vehvilainen H., Koricheva J. (2006). Moose and vole browsing patterns in experimentally assembled pure and mixed forest stands. Ecography 29(4): 497–506. https://doi.org/10.1111/j.0906-7590.2006.04457.x. Vivas H.J., Saether B.E. (1987). Interactions between a generalist herbivore, the moose Alces alces, and its food resources: an experimental study of winter foraging behaviour in relation to browse availability. The Journal of Animal Ecology 56(2): 509. https://doi.org/10.2307/5064. Wam H.K., Hjeljord O. (2010). Moose summer and winter diets along a large scale gradient of forage availability in southern Norway. European Journal of Wildlife Research 56(5): 745–755. https://doi.org/10.1007/s10344-010-0370-4.